I haven't had a whole lot to report lately, but I did do a little bit of fishing this past week at the beach in Ocean City MD. Marianne and I stayed with her family from Saturday until Tuesday afternoon. I only have one picture to share with you so far (and its a cell phone pic, so poor quality) but I should have some more to post soon--after they are downloaded. We had a great time! My brother-in-law Chad and I did a some flounder fishing, and caught a couple small ones. 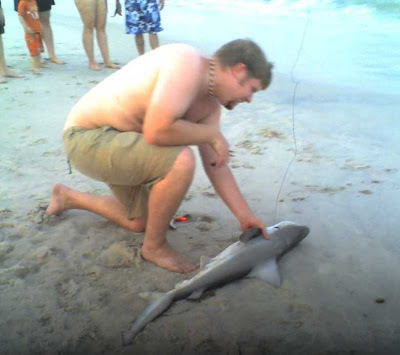 And one evening we all hung out on Assateague, made a fire, and fished for some sharks, also a lot of fun... (minus the horrible mosquito bites, lol) We ended up catching one shark, which I think was a small sandbar or maybe a dusky shark. This was the first time I tried using eels as bait for sharks, and I was surprised and happy that I caught one. This was also the first time that I had my kayak on the open ocean, as I kayaked a couple of baits out pretty far from the shore. It was lot of fun, and a bit interesting lauching throught the waves and then again trying to land safely on the shore break when I came back in. Hopefully I'll get some more pics up from our trip soon. Next week I'm planning to head back down for a couple days to meet up with my buddy Zack and his fiance Jenny and her family. My buddies Pete and Chad might come along, too. So hopefully the weather will be good and I'll have some more fun stories to share next week. That's all for now. Thanks for reading!